Today is a very auspicious day. It is the very holy birthday of Srila Prabhupada Bhaktisiddhanta Sarasvati Gosvami Thakura. I want to speak something of his glory. If this great self-realized soul had not descended in this world, no one would have known the meaning of pure bhakti. No one would have known the identity of Srila Bhaktivinoda Thakura, the book Sri Caitanya-caritamrta, or the books and glories of the Gosvamis. Srila Bhaktivinoda Thakura gave us two jewels, the first one being the holy birthplace of Sri Caitanya Mahaprabhu. He manifested Gaura-dhama. Before him, no one knew where Sri Caitanya Mahaprabhu had taken birth. No one knew where Sridhama Mayapura was actually located. Secondly, he gave the jewel of Srila Bhaktisiddhanta Sarasvati Thakura, who preached throughout the world and universe the glories of Sri Caitanya Mahaprabhu, Sri Nityananda Prabhu, the conceptions of the disciplic line of Srila Rupa Gosvami, and the glories of Sri Sri Radha and Krsna. Before the birth of Srila Bhaktisiddhanta Sarasvati Gosvami and Srila Bhaktivinoda Thakura, and after the disappearance of Srila Narottama Thakura, Sri Syamananda Prabhu, Srinivas Acarya, and especially Srila Visvanatha Cakravarti Thakura and Srila Baladeva Vidyubusana, pure bhakti was covered. The sahajiyas’ ideas were spread throughout Sri Vraja-dhama and Sri Navadvipa dhama. Their influence prevailed and there were hardly any real Vaisnavas. In the name of Sri Caitanya Mahaprabhu, His philosophy and His prema-dharma, the sahajiyas were degraded in character and were most sinful. To live with widows, to dance and sing with them, and to smoke cigarettes and drink wine with them – this was their idea of parakiya- and vaisnava-dharma. Because of their influence, none of the learned and aristocratic persons even wanted to hear the name ‘Gaudiya Vaisnavas’, what to speak of follow them. They hated Gaudiya Vaisnavas. There are eleven sahajiya groups, like gaura-nagari, sakhi-bekhi, aul, baul and so on. In India, their main function was widow-bhajana, and they maintained their lives by doing professional kirtanas during funeral processions. After following a dead body and singing, they would receive a donation from the deceased relatives. True vaisnava-dharma is completely pure, but due to these practices, all aristocratic persons began to hate it, and Mahaprabhu’s message was thus in danger. At that time, Srila Prabhupada Bhaktisiddhanta Sarasvati appeared in Sri Jagannatha-dhama as the son of Srila Bhaktivinoda Thakura. He was born with many symptoms of a great soul, such as natural tilaka marks on his body and the impressions of kanti-mala on his neck. At that time Srila Bhaktivinoda Thakura told his wife Bhagavati-devi, “He is not an ordinary boy. No ordinary boy can have these natural tilaka, kanti-mala and other signs. He has taken birth in Jagannatha Puri, and also I have prayed to Vimala devi, the consort of Lord Jagannatha. He has come by Her mercy.” The Thakura thus gave his boy the name Vimala Prasada. Prasada means ‘mercy’. After six months, the baby became qualified to have his anna-prasana mahotsava (grain ceremony in which a baby is fed grains for the first time). At the same time the Jagannatha Chariot festival was taking place. The three carts carrying Jagannatha, Baladeva and Subhadra were in procession and had stopped in front of Srila Bhaktivinoda Thakura’s house for three days. The Thakura was the manager of the entire festival. Therefore, without any problem or obstacle, he took his son upon the chariot and placed him in front of Jagannatha-deva. He took some prasadam from there and placed it in the mouth of Vimala Prasada, and at that time the flower garland from the neck of Lord Jagannatha dropped on the baby’s head. It is a very good sign when the Deity’s garland falls in this way, for it means the recipient is being blessed by the mercy of Lord Jagannatha, Sri Govinda-deva, Sri Gopinatha, or any other Deity. This also happened to Sri Caitanya Mahaprabhu Himself. Thus, Vimala Prasada’s anna-prasana mahotsava was observed. Gradually he began to grow up. After some time, when he became a boy of five years, Srila Bhaktivinoda Thakura himself gave him harinama and the arcana mantra for the worship of Lord Kurmadeva, the Deity of Sri Krsna’s Tortoise incarnation. He began to learn many things. He was always with Srila Bhaktivinoda Thakura, carrying his father’s Sri Bhakti-rasamrta-sindhu, Sri Ujjvala-nilamani, Sri Caitanya-caritamrta and other books on his own head as he accompanied him to various places for preaching or giving classes. Thus, from the beginning of his life, very good samskaras came to him. This, of course, was his naravata-lila (human-like pastimes), because he was actually the eternal associate of Sri Varsabhanavi-devi dayitaya, near and dear to Varsabhanavi devi, Srimati Radhika. In his pranama mantra he is referred to as krsna-presthaya. Krsna has so much love and affection for the manjaris, so Srila Sarasvati Thakura Prabhupada is also near and dear to Him. The words ‘gaura-vani-sri murti’ is also present in his pranama-mantra. This adjective has also been used in the pranama mantra of Parama-pujyapada Srila Bhaktivedanta Svami Maharaja, and we must go deep to uncover its meaning. Gaura-vani refers to that which Gaura (Sacinandana Gaurahari) preached, and that which He inspired in the heart of Srila Rupa Gosvami – the glorification of the mood of the gopis and Srimati Radhika. Sri Gauracandra said, “O Nityananda, O Haridasa Prabhu, you should go door to door and preach ‘Bolo Krsna, bhaja Krsna, karo Krsna (chant Sri Krsna’s name, worship Him, and serve Him)”. This is gaura-vani. It is also what Mahaprabhu discussed with Sri Raya Ramananda and Sri Svarupa Damodara in the Gambira. In that regard it is especially His hidden revelation of the meaning of ceto-darpana-marjanam, yugayitam nimesena caksusa pravrsayitam, and aslisya va pada-ratam. This is gaura-vani. It is also the love and affection explained by Srila Rupa Gosvami in Sri Bhakti-rasamrta-sindhu, Sri Ujjvala-nila-mani, Sri Vidagda-madhava and Sri Lalita Madhava. This is gaura-vani. If one is not serving his Gurudeva, if he does not have strong belief in his Gurudeva, and if he is not following his line of thought, such a person must be sahajiya. This is taking place nowadays. We are preaching and therefore they are somewhat stopped, but I do not know what will happen after I leave this world. A very dangerous stage is coming. Many Iskcon devotees left Srila Bhaktivedanta Svami Maharaja, their Guru, Srila Prabhupada, and they went to Radha-kunda. They wanted to remember the 24-hour daily amorous pastimes of Sri Sri Radha and Krsna (asta-kaliya-lila) as goopis – not gopis, but goopis – and for this offense they went to hell. They became ‘babajis’. Keeping two, three, or four widows with them, they began to relish their ‘parakiya-bhajana’. I know not only two or three or four, but so many. They want to jump – not to practice bhakti-yoga. They want to be gopis by paying two pennies to any bogus person who will ‘give’ them siddha-deha, their perfected personal identity, and tell them, “You are a gopi.” Such persons will give a name, and all other false information, about that ‘gopi’. Then, after some time, such ‘disciples’ imagine themselves absorbed in Sri Sri Radha and Krsna’s most confidential pastimes in the kunjas. Please do not try to be like that – do not go in that direction. There are some ill-charactered persons who have been rejected from the Gaudiya Matha, and they also went to Radha-kunda to become babajis in that asat-sampradaya. Such characterless or unqualified persons imagine themselves to be absorbed in the asta-kaliya-lila of Radha and Krsna in Their midnight and end of the night (nisanta-lila) pastimes. At that time, Radha and Krsna are meeting in a kunja. If They are alone, half naked and kissing each other, what will that ‘meditator’ think? Material ideas will come to him. He is bound to think in this way, and this is wrong. Sri Sri Radha-Krsna-lila is transcendental. Only a saintly person like Sri Sukadeva Gosvami who was a brahmacari from his birth, or like Sri Narada Gosvami who is a liberated soul, or like Lord Sankara who is an ideal personality, can properly think of asta-kaliya-lila. You should offer obeisances to such pastimes and try to practice bhakti-yoga as our predecessors acaryas have taught us. Gradually begin from the root of the tree, then be qualified to climb, and then reach the top. Then you can take the fruits. Otherwise, you will have nothing but these bogus ideas. Try to follow Srila Bhaktisiddhanta Saravasti Prabhupada, our Gurudeva Srila Bhakti Prajnana Kesava Gosvami Maharaja, and Srila Bhaktivedanta Svami Maharaja. Otherwise, you will be like those misdirected persons and you will also go to hell. Srila Bhaktivinoda Thakura sent his son to a Sanskrit college and, at the age of twelve perhaps, he received the degree in astrology and the title Siddhanta Sarasvati. At that time he had become the champion in astrology throughout Bengal, and therefore all the elevated scriptural scholars gave him that title. Sometimes Srila Saravasti Thakura would defeat the arguments of his teachers, and he therefore left that college. Our Gurudeva also left college. They both left because they had nothing to learn from the teachers there. During that time, the governor of Bengal was Ashutos Mukarji. At that time the Indian government was ruled by the British, and the British had made him governor. He was very qualified. 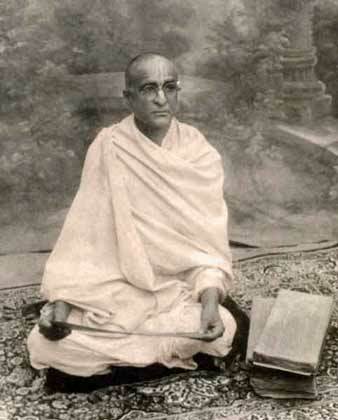 He established the Calcutta University, and there he reserved a seat for Srila Bhaktisiddhanta Sarasvati Thakura. He requested him, “Oh, please come and be the head of the department. Please oversee it. You are the most qualified for this.” Srila Sarasvati Thakura replied: “I have not come to this world to count the stars in the universe. I have not come to count the sands on the ocean beaches of the world. I cannot fulfill your desire.” As long as Srila Bhaktisiddhanta Sarasvati remained in this world, that post was reserved for him, but he never accepted it. Srila Bhaktivinoda Thakura then thought: “What should I do for this boy?” He established a medical dispensary and told his son, “Remain there, and somehow maintain it so that there are no losses. Srila Prabhupada Sarasvati Thakura began to do so, but the dispensary failed, and again the father wondered what to do. There was a king in India at that time who was the king of Kashim Bazar, and he was a bosom friend of Srila Bhaktivinoda Thakura. He told the Thakura, “I want a tutor for my son. He will be king after me, so I want a tutor for him.” Srila Bhaktivinoda Thakura replied. “Let us try; I will tell my son to teach him.” At that time the salary was very high. Srila Sarasvati Thakura went to the king and began to teach his son that the entire world, along with all the sandhis and samas (movements of the moon) is an emanation of Krsna and non-different from Him. He taught as Mahaprabhu taught when He was a teacher in Navadvipa. After some time the boy became very learned and a scholar in Vaisnava philosophy, and the result was that he became renounced. He was not like you. Many of you have been hearing for sixteen or twenty years, but you have not become detached. On the other hand, being taught by Srila Saravati Thakura, that prince became detached from worldly enjoyment. At that time the king had a very big library, and Srila Sarasvati Thakura Pabhupada studied the thousands of books there – all the Gosvami’s books, Srimad Bhagavatam, Brahma-sutra, books of the other sampradayas, and so on. Though he already knew their contents, he studied those books just to set an example for us. Quickly, in one or two years, he completed that study. Srila Prabhupada very quickly preached over the entirety of Bengal. He began to establish the Navadvipa-dhama parikrama and Kartika parikrama. Then, after some time he gave sannyasa to very qualified disciples – who were practically only boys. At that time Pujyapada Bon Maharaja, Pujyapada Sridhara Maharaja, Pujyapada Vaikhanas Maharaja, Pujyapada Auduloumi Maharaja and many others were only about 25, 26, or 27, and they were the cream of all qualified personalities in Bengal and all of India. They were the upper-class. He brought them to himself, gave them brahmacarya and sannyasa, and established Sri Caitanya Matha. What is the meaning of the word ‘matha’? Mathanti vasanti satrah – it is a place in which students study and learn under the guidance of their Gurudeva. It is like the gurukulas of previous times, wherein boys would study and become very qualified in all kinds of siddhanta (philosophical conclusions). Srila Bhaktisiddhanta Sarasvati Thakura established this. He gave brahmacarya to many beautiful boys, and thus very quickly preached all over India. After some time he wished that this religion of Sri Caitanya Mahaprabhu would also go to the Western countries, and he inspired Srila Bhaktivedanta Svami Maharaja – Sri Abhaya Caranaravinda. By his mercy Parama-pujyapada Srila Svami Maharaja went abroad and preached throughout the world in just a few years. Srila Svami Maharaja established preaching centers and translated and published many books, which were in turn translated in all the prominent languages of the world. You have come by his mercy, and the root mercy is that of Srila Bhaktisiddhanta Sarasvati Gosvami Thakura. This entry was posted in Hari Katha, Movies, MP3.